The 202 kg NEN 004 (field name) iron meteorite. Photo taken in Agadez Niger, December 2015. Photo courtesy of S.I. Recent discoveries of alluvial gold deposits in Northeast Niger have led to an increased prospection activity of artisal miners in the Air, Djado and Ténéré Tafassasset area. Within the course of 14 months, from January 2015 to February 2016, mining and prospection activity resulted in the discovery of at least seven masses of meteoritic iron with a total weight of 606 kg, with the largest mass weighing ~320 kg (status of 28 February 2016). 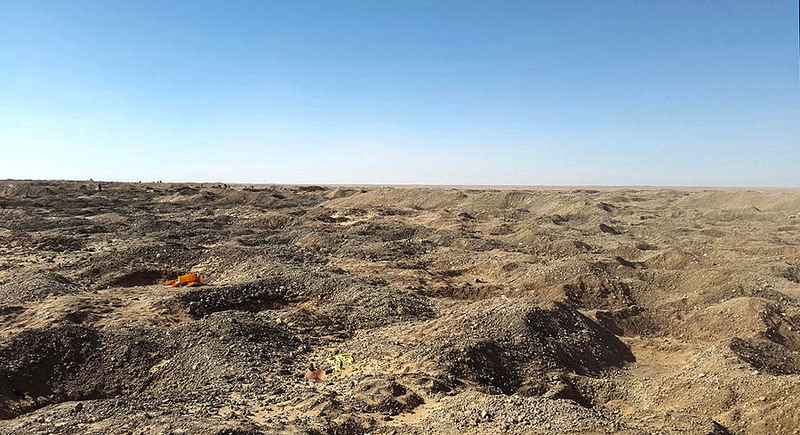 According to poor documentation and concealment of find information, the exact locations and circumstances of the finds remain vague at present. As of February 2016, sample material is available for one of the masses only. Yet there is evidence supportive of a pairing of all seven masses. 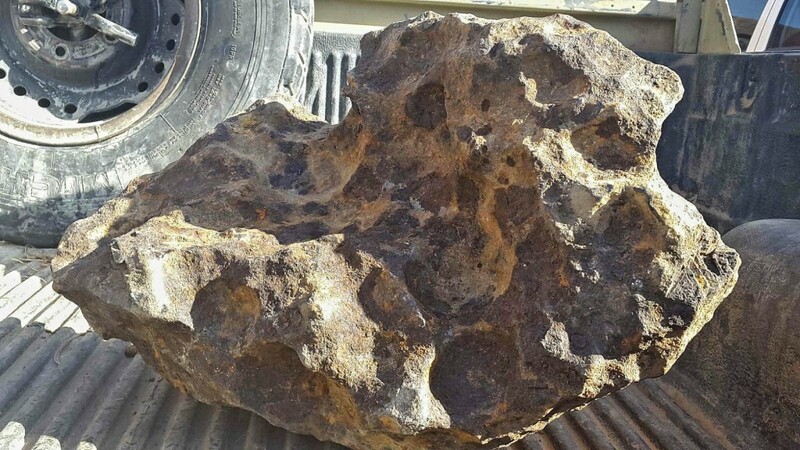 Pending positive proof, the Northeast Niger (NEN) finds represent the 3rd largest iron meteorite of Northern Africa and 7th largest of the continent. The present report aims at presenting, evaluating and preserving the information available in order to create a permanent record for future reference. The second objective is to raise awareness among researchers, curators, collectors and dealers of meteorites, for an effort to either verify or falsify a common origin and pairing of the NEN iron meteorite group, and to determine or reconstruct missing recovery data. The serir plain of the Ténéré Tafassasset in Northern Niger is bordered by the Air Massif in the west and the sandstone scarpland and inselberg landscape of the Djado and Ouar Plateaus in the east, all part of the presently hyper-arid central Sahara. 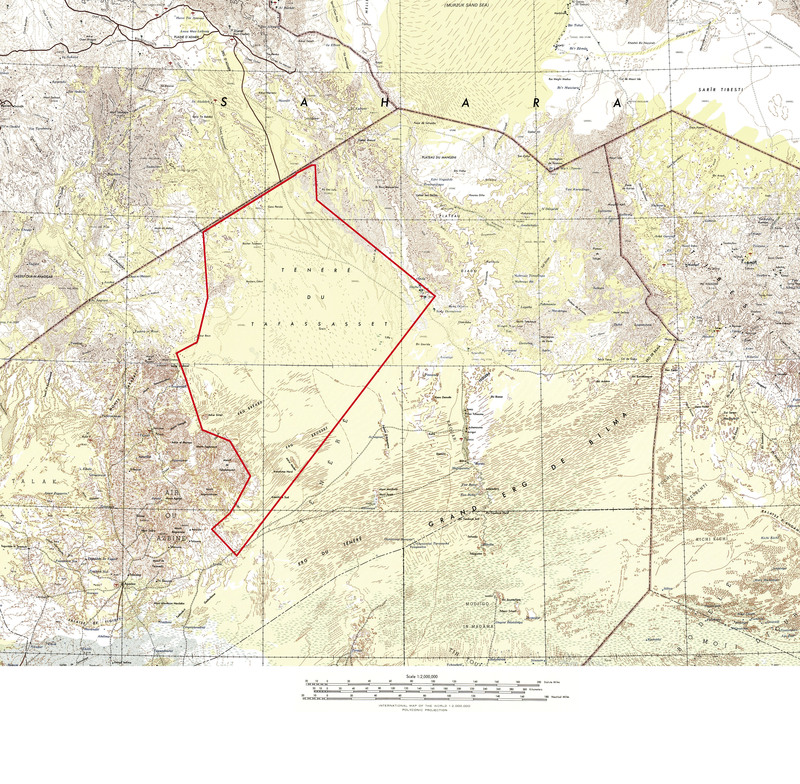 In the north, where the Tafassasset connects with the fringes of the Murzuq Basin, from 21°-23°N it is cut by the border separating Niger’s Agadez district from the Wilaya Tamanrasset in Algeria. In the south, at 19°N, the Tafassasset merges with the Erg du Ténéré and the Grand Erg de Bilma as part of the Chad Basin (Baumhauer 2009). The landforms of the Tafassasset and the greater Djado go back to Paleogene etchplanation under humid-tropical conditions, followed by almost complete stripping of the original soil cover and silcrete induration during the Oligocene (Busche 2010). A period of deep-reaching karstification under still very humid conditions was followed by gradually decreasing humidity up to the end of the Neogene, which led to increasing etchplanation and the forming of scarplands, inselbergs, intra-plateau basins and pediments (Busche 2010). A final relapse to more humid conditions at the beginning of the Pleistocene, formed landside fringes along the escarpments of the Air, Djado and Hoggar, which later on were locally reshaped by at least three alternating phases of Quaternary pluvial river aggradation (Busche 2010, Pachur 2007). The current landscape received its final shaping by aeolian corrasion during the mostly arid conditions of the Quaternary, and is part of the largest wind-corrasion landscapes on Earth (Busche 2010). Under the present conditions, a distinct coating of dark brown desert varnish has developed on all outcropping bedrock in the region. Albeit with local variations in the onset and intensity of rains, the last major humid phase with middle-terraces deposition in the greater region occurred between 16 and 7.4 ka BP under the influence of a winter west-wind regime (Baumhauer 1989, 2009). The present day extreme aridity of the region in the Central Sahara is governed by its latitudinal position within the trade-wind belt and its extreme continentality, which results in a low cloud cover throughout the year and Summer maximum temperatures of above 40°C (Baumhauer 2009). The region is hyper-arid with an annual rainfall of 20 mm (Baumhauer 2009), falling as occasional cyclonic winter rains in the north (Busche 2010). The predominant north-easterly trade wind appears to have been unchanged during the Quaternary (Baumhauer 1989, Busche 2010). It is also the dominating landshaping factor of the present landscape, controlling the NE-SW orientation of longitudinal dune systems and sandstone yardangs. Typical prospection and mining landscape with numerous pits in the eastern Ténéré Tafassasset near Djado, Northeast Niger. Photo taken in December 2015 by S.I. Subsistence mining has turned large surfaces in the Ténéré Tafassasset into lunar-like landscapes. Due to the critical lack of infrastructure and water in particular, artisal mining in the Tafassasset is conducted without machinery. Individual deposits are identified by scouts and exploited by the help of metal detectors and pick and shovel. This approach limits the extracted gold to nuggets and flakes but excludes gold dust. Video recorded near Djado, Northeastern Niger, December 2015. Footage courtesy of S.I. In November 2013, two hours north of Djaba, in the northern Ténéré desert, a group of Tuareg in a Toyota Hilux bogged down their vehicle. Upon freeing the wheels, the passengers noticed that the sand was quite shallow and just covering the bedrock. On top of the latter, there was some gravel, and from this, one of the men picked up a tiny yellowish crumb, immediately recognized as a gold nugget (Source B). The group stayed at the site and within short time, more gold was found. The men made three round trips, selling their finds in the district capital Agadez, and returning anew to the secret site with tools and supplies. It is said, that the group made a fortune, but after the third trip, word got round in Agadez, and triggered what became the biggest gold rush in the country’s history (Fioriti 2016). Two years after the initial discovery, in mid 2015, some 20,000 artisal miners from around Niger, Chad, Sudan and Nigeria inhabited the western fringes of the inhospitable Djado Plateau, which had become the base of the regional gold mining operations (Fioriti 2016). The knowledge of potential gold deposits in the Tafassasset, however, is not new. Samples taken by an Algerian mining company in the 1970s and 1980s proved to contain 10 ppm Au in average (Hampel 2001), but industrial mining had been considered unfeasible due to low gold prices and the remoteness of the area. In 1999, Canadian companies Resources Robex Inc. and GeoAfrica Gold Corp. explored the Tafassasset anew (Robex 1999, Mobbs 2000). The probing confirmed the widespread occurrence of massive auriferous quartz veins in the triangle between Adrar Bous, Djado and the Niger-Algerian Border (Hampel 2001). In an exploration proposal for GeoAfrica Gold, dated April 2001, Hampel (2001) came to the conclusion that the Tin-Kerandet main quartz vein field and its southern satellite deposits contained gold in the range from 0.1 g to 200 g per metric ton. At 100 m intervals, grades of 6.6, 40.4, 6.3, 32.8, and 15.8 g/t of gold were recorded along one vein (Robex 1999). Following these results, the Tafassasset North prospecting license was expanded from 2000 km2 to 100,000 km2 to allow for exploration of adjacent vein fields. An application was submitted to allow for detailed drilling and mapping of key targets within the initial license area (Robex 1999). The plan was to define a required resource of 50,000 ounces that was needed for feasible economic exploitation of the deposit (Robex 1999). However, presumably due to the same reasons as earlier, no operation other than sampling was initiated. The licences expired, and seven years later, in April 2007, Trendfield Gold Mining Ltd. (TGM) acquired new exploration permits for Tin Kéradet I, II, III and IV in the northern Tafassasset area (Trendfield 2007). At the same time, TGM requested a prospection permit for the Tafassasset region, covering an area of 50,000 km2 (Trendfield 2007). The company expected gold reserves totalling 76,000 oz in the tested depth of 0 to 50 meters and considered the Tafassasset gold field as an extension of the Tiririne-Harane goldfield immediately to the north, close to the border with Algeria, and which has a defined resource in excess of 300,000 oz at an average grade of 15 g/t. Again, however, no industrial operation commenced. In April and August 2014, ANP/ONEP subsequently reported the discovery of two new gold fields in the area. This time, no corporations were involved, but the discovery was made by local subsistence miners. The first site is said to be 40 km from Mt. Orida, which is a small settlement at the eastern fringe of the Djado Plateau, 20 km northeast of the village of Djado (ONEP 2014, a). According the mayor of Tabelot, Adam Efangel, the second deposit is located in the eastern Air Mountains around Mount Ibl, about 200 km northeast of Tabelot (ONEP 2014, b, conflicting location data in report). This latest find marks the expansion of mining activities from the eastern Tafassasset to its western border and into the fringes of the Air Mountains.